The worst Monday of all Mondays is the one straight after Christmas when everyone is back to work and school. 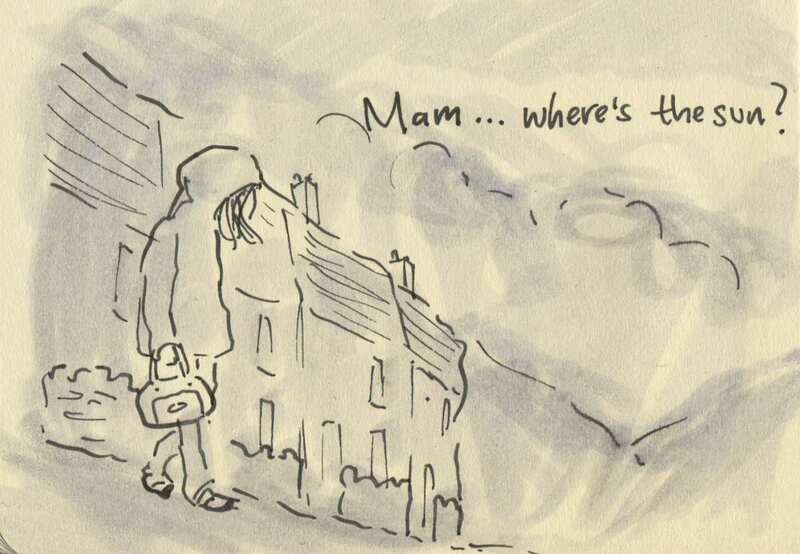 Posted on January 5, 2015, in Uncategorized and tagged Children, Doodlemum, Drawing, Family, Humour, Illustration, Life, Pen and Ink, school, Sketchbook. Bookmark the permalink. 6 Comments. The sun?…it went someplace warm for vacation! Yup – a very bleak day indeed. It’s gone off to Australia/ new Zealand! What a grotty day to go back to school, although in recent years here in Kendal, the snow has fallen on the first day of term- not enough to close the schools, but plenty to play in, which I think is even worse! Cheer up Millie, not long until Feb half term!